Water use efficiency is widely recognised as a key performance indicator for crop production. 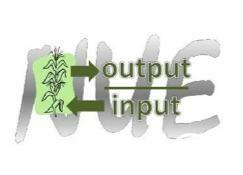 Similarly NUTIRENT USE EFFICIENCY (NUE) for nitrogen, phosphorus, potassium and sulphur can indicate resource use effectiveness and economic performance of these important crop input. Fertilizer is frequently the biggest single cost for cropping. With slim margins, it is important to achieve the best possible return on money invested in fertiliser. There is also international interest is assessing nutrient use efficiency to first measure this and then look for strategies to improve efficiency, while maintain productivity and food security. Efficiency can best be measured over a number of seasons as the input and output of nutrients at a field or farm scale. In Australia, while national figures for the grains industry can be estimated (Table 1) there are no reliable at state or regional level, and this project aims to fill that gap by collecting farm/field level measurements fertilizer use, grain or other material produces, along with an estimate of legume N input, These data will be collected, collated and provided back to the industry. 2. Assessment of the effect of management on the balance of N in the field or farm (Partial Nutrient Balance). Table 1. An example of nitrogen rate, partial factor productivity and partial nutrient balance for wheat growing in different countries. No account is taken of fixed N or N derived from manures in these calculations. International figures for 2007-2009, Australian data for 2010.